“Firsts” are something of a theme when it comes to the RM 50-03 Tourbillon Split Seconds Chronograph Ultralight McLaren F1 — or the RM 50‑03, as we’ll happily address it from here on out. A “racing machine for the wrist” in the truest sense, the RM 50-03 is indeed a watch of firsts. The first product of a promising partnership between an iconic watch brand and an automotive powerhouse; the first watch to incorporate a first-of-its-kind material discovered through Nobel Prize-winning research; first place on the list of “Lightest Split-Seconds Chronographs Ever Made”. Did we mention that? And did we mention that this particular split-seconds chronograph of world-record lightness also includes a tourbillon? The RM 50-03 is the first horological fruit of an exciting ten-year partnership announced last year — one that’s brought two icons of their respective forms of mechanical engineering, Swiss watchmaker Richard Mille and British Formula 1 automaker McLaren-Honda, together in holy horological matrimony. The union, surely long written in the stars, will see the two houses combine their powers of radical innovation to craft Formula 1-inspired mechanical marvels like only they can. Unveiled at this year’s Salon International de la Haute Horlogerie (SIHH), the partners’ first co-branded watch is one that fits the “mechanical marvel” bill to a tee. A hand-wound tourbillon featuring a split-seconds chronograph, 30-minute totalizer, power reserve and crown-controlled torque and function indicators, the RM 50-03 packs considerable horsepower under its hood. Not that it necessarily feels like it. That’s because the RM 50-03, in all its complicated glory, weighs in at a paltry 38 grams, strap and all. How exactly did Richard Mille achieve that world-record low in such a high-performance, highly technical piece? Well, they started by enlisting the expertise of the Nobel Prize-winning researchers of the University of Manchester’s National Graphene Institute. In 2010, University of Manchester Professors Andre Geim and Konstantin Novoselov were awarded the Nobel Prize in physics for their discovery of graphene, a featherlight, cutting-edge nanomaterial that’s six times lighter than steel and a whopping 200 times as strong. It doesn’t take a doctorate in physics, nor a Nobel Prize for that matter, to appreciate graphene’s potential in terms of facilitating exciting material innovation. 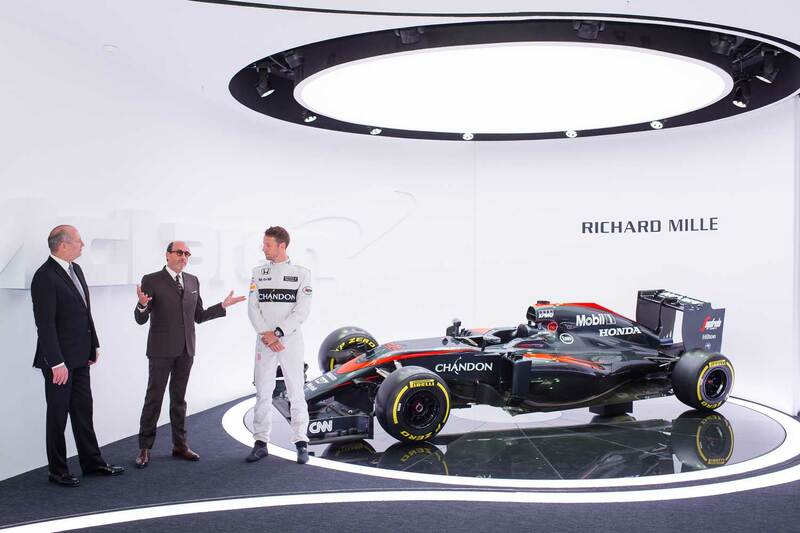 In Richard Mille and McLaren-Honda, we see two partners that have made a habit of pushing limits in this area, designing ultra-light and resilient chassis and components to fashion true “racing machines” for both the track and the wrist. The perennial-champion automaker and avant-garde brand, itself helmed by a petrolhead of world renown, are the perfect stewards to introduce the dynamic material to the horological world. The RM 50-03 is the first wristwatch fashioned from Graph TPT: a TPT (thin-ply technology) Carbon whose physical properties have been enhanced via graphene injections — a sort of horological steroid treatment, if you will. The RM 50-03’s three-part tonneau case derives considerable strength and lightness from the first-of-its-kind materials mixture, which also provides the watch’s unique striated aesthetic. The groundbreaking graphene treatment is only partly responsible for the RM 50-03’s record-setting lightness, however. By all rights, the watch’s workhorse 50-03 caliber has no business weighing in at a negligible seven grams. Not with that split-seconds chronograph, the tourbillon, and those dial-side indications. The secret to the movement’s featherlight weight lies in the manufacture’s decision to extensively skeletonize its components and also employ a combination of grade 5 titanium and TPT Carbon to lighten up the baseplate and bridges. The RM 50-03’s transverse case, which supports the entire caliber, is also forged from TPT Carbon, and happens to feature a design that takes after the wishbone-shaped suspension structure of a McLaren-Honda Formula 1 car. Perhaps appropriately, considering its high-octane inspiration, this resoundingly sound design enables the movement to withstand incredible amounts of g-force, including shocks measuring up to 5,000Gs. The movement, the caliber RM 50-03, beats at 21,600 vibrations per hour (3Hz) and features a 70-hour power reserve. In contrast to the manufacture’s previous chronographs, the RM 50-03 features a new, state-of-the-art split-seconds system that reduces the number of columns from the traditional eight to six, streamlines the mechanism’s movement, and optimizes its stability. 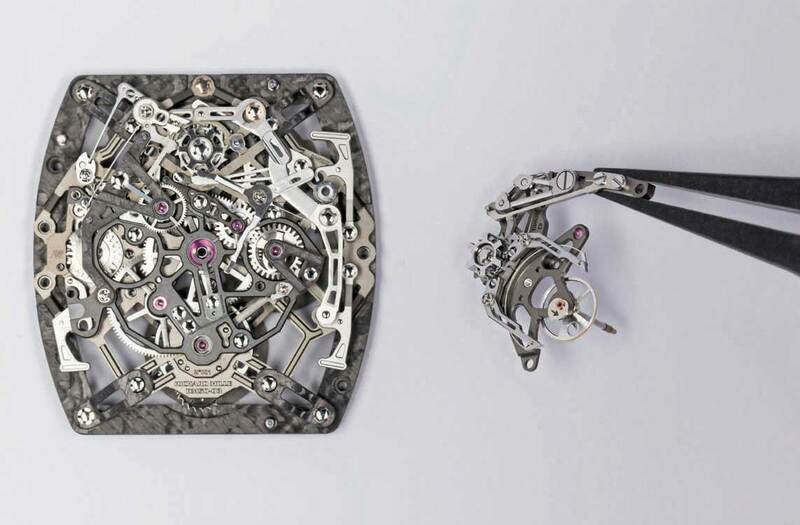 This clever revamp has also led to a reduction in arbor friction and cut the chronograph’s energy consumption by half. Turning our attention to the dial, arched between 12 and two o’clock is the RM 50-03’s torque indicator (1), which displays the tension of the mainspring, resembles a dashboard indication, and appropriately features a red, yellow and green color scheme. This function allows the wearer to optimize the winding of the watch, and indicates whether the mainspring is too slack, too tightly wound, or fine and dandy. At three o’clock sits the function indicator (2), which itself resembles an automobile gearbox and essentially indicates whether the crown is currently in “wind”, “set” or “neutral” mode. Speaking of which, the RM 50-03’s striking, oversized crown bears more than a passing resemblance to wheel rims, and is also torque-limiting to prevent accidental over-winding or overstressing of the barrel spring. The chronograph’s hollow pushers are also auto-inspired, resembling the air-intake ducts of a McLaren-Honda car. In prime position at six o’clock is the small seconds (3), and visible beneath it, the lightweight tourbillon. The 30-minute totalizer occupies the nine o’clock spot, just below the watch’s power-reserve indication (3). The RM 50-03 measures in at 44.50mm × 49.65mm × 16.10mm and is completed with a durable, graphene-injected “comfort” rubber strap. It likely goes without saying that the RM 50-03 is a limited release, which will grace, ever so lightly, some 75 collectors’ wrists. And while some would say that you can’t really put a price on “moving” innovation, especially when it’s the product of two icons of their respective industries, the more pragmatic among us would dutifully note that, actually, yes, you certainly can. Everything has a price, and the RM 50-03’s happens to be a whopping $980,000 (plus tax). Yes, the RM 50-03 truly is a standout piece — in so many ways. It’s also a very promising first effort from the radical Swiss manufacture and its kindred-spirit partner. Only time will tell if the team will manage to continue wowing us with the level of extreme innovation we’ve come to expect from their wares. As it stands now, the RM 50-03 Tourbillon Split Seconds Chronograph Ultralight McLaren F1, lengthy name and all, looks like a great first start.